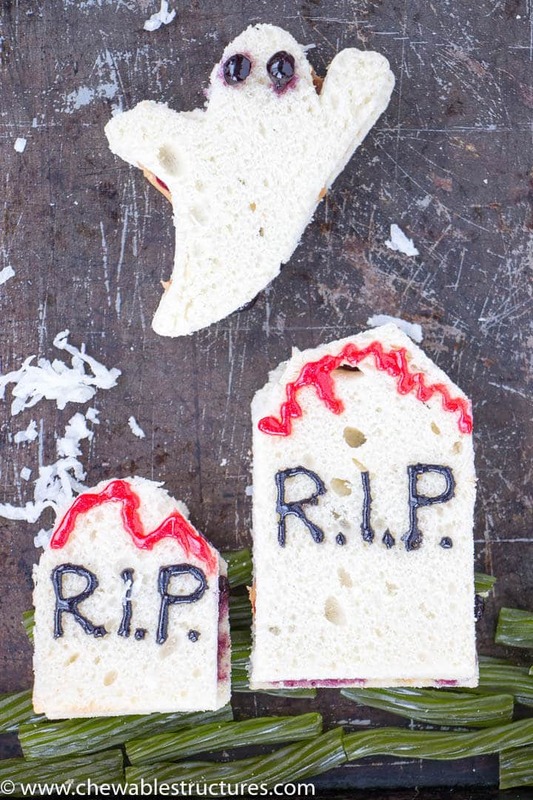 It’s the second week of our Halloween Party Food series and I’m thrilled to show you how to make a peanut butter and jelly sandwich look like mini ghosts and tombstones! I’m sharing 4 helpful tips so that you can easily make these healthy Halloween treats for your next Halloween potluck! 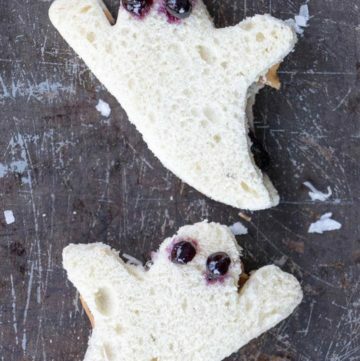 Check out this adorable ghost-shaped peanut butter and jelly sandwich. They even have spooky blueberry eyes! WATCH MY RECIPE VIDEO BELOW to see how fun and easy it is to make these spooky treats. Also, I’m posting two more scary recipe videos before Halloween, so make sure to SUBSCRIBE to my YouTube Channel so that you can see what spooky structure we’re building next week. Remember to turn on notifications! Ok, it’s TIME TO BUILD! I’m sharing 4 tips on how to make a peanut butter and jelly sandwich ghost for Halloween! Tip 1: Buy the ghost cookie cutter first, then the bread. 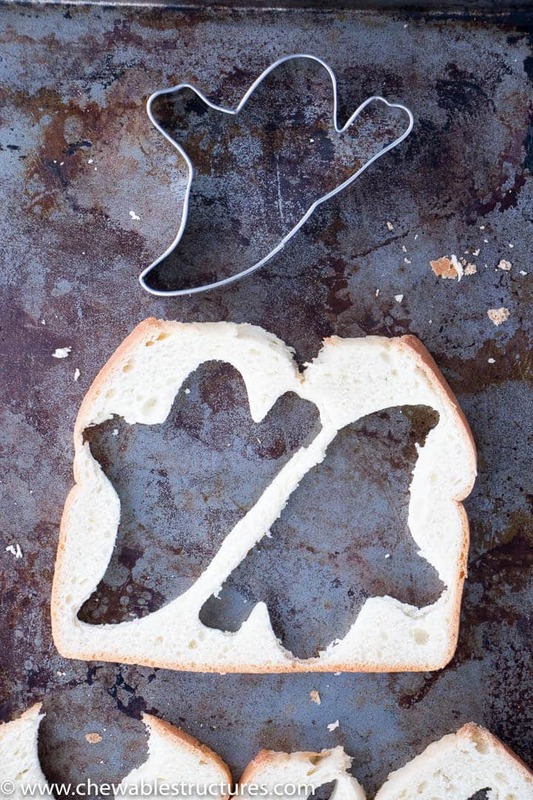 This way you can minimize the amount of bread wasted when you cut the ghost patterns. I’m using a 3-inch ghost cookie cutter and I can fit two ghost patterns on each slice of bread. I hate wasting food, so I’m also saving the remaining bread to make homemade croutons or bread pudding. Yum! I’m using this 3-inch ghost cookie cutter. Tip 2: Sometimes it’s hard to cut bread using a cookie cutter. Watch my above video to see what I’m talking about. Don’t worry though, to fix this, just use a sharp knife to clean off the edges. Tip 3: It doesn’t have to be perfect. In the video you can see me carving off more and more bread when I’m trying to shape the tombstones. It doesn’t have to be perfectly shaped like a tombstone because we’re going to cover it up with edible red sparkle gel, which looks like blood. So, don’t fret this step. Tip 4: Old baking sheets and coconut flakes make it even spookier! Finally, to plate it, try to find the darkest baking sheet you have. The more burnt, the better. A dark baking sheet gives a spooky nighttime look. Also, sprinkle some coconut flakes to make it a bit eerie with fog/clouds. So creepy! For the grass, I’m using green apple licorice. It’s always hard to find healthy Halloween treats, so I love that this sandwich is packed with peanut butter and blueberry preserves. I found a great article in SF Gate about the benefits of peanut butter and jelly sandwiches, including how many calories. 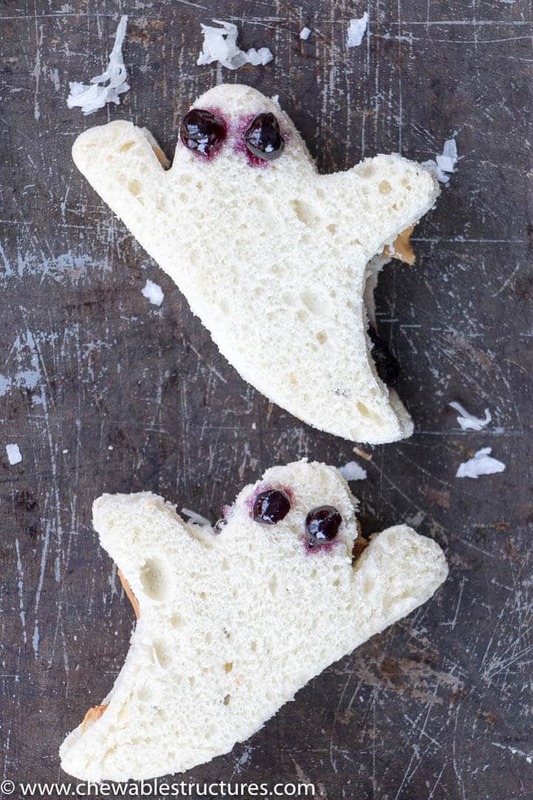 Adorable ghost and tombstone-shaped peanut butter and jelly sandwich. You just need a ghost cookie cutter and a bread knife. 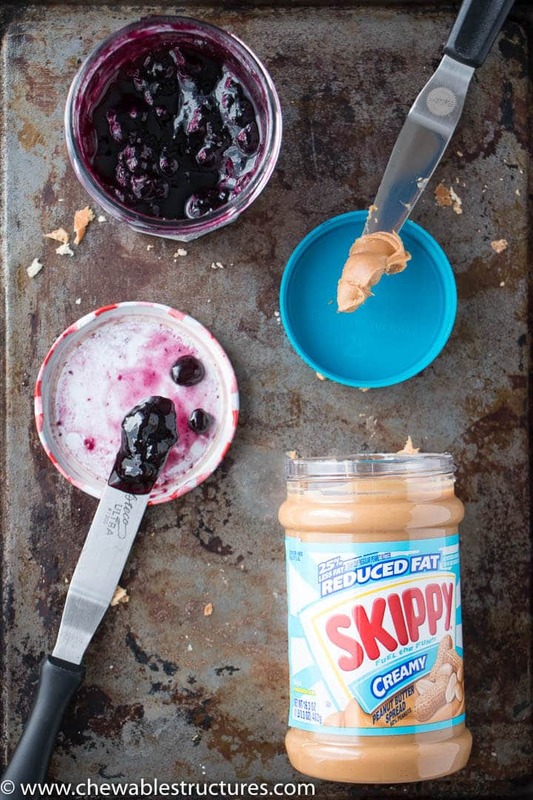 The star of this peanut butter and jelly sandwich is the Skippy creamy peanut butter and blueberry preserves with whole blueberries. If you like my video, please click LIKE and share it with your friends. For the full instructions, check out chewablestructures.com. This peanut butter and jelly sandwich looks so good I can’t wait to bite in. Happy Halloween! 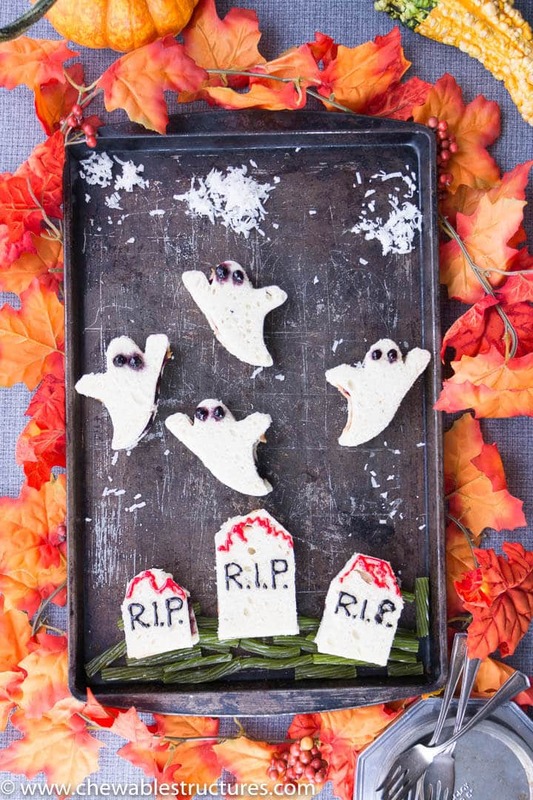 It’s the second week of our Halloween Party Food series and I’m thrilled to show you how to make a peanut butter and jelly sandwich look like mini ghosts and tombstones! I’m sharing 4 tips with you so that you can easily make these healthy Halloween treats for your next Halloween potluck! Using a 3-inch ghost cookie cutter, cut 8 ghost patterns out of 4 bread slices. Using a small knife, spread 1 tbsp of peanut butter and 1 tbsp of blueberry preserves onto 4 ghosts. Add the top of the ghost. Using chopsticks, add two blueberries to the top side of the peanut butter and jelly sandwich so that they looks like eyes. Using a bread knife, remove the crust from 3 bread slices and cut them into the shape of a RIP tombstone. Watch my video for a better visual. Using a small knife, add 1tbsp of peanut butter and 1 tbsp of blueberry preserves to 3 tombstones. Add the top of the tombstones. Using black sparkle gel, pipe “R.I.P.” on the sandwich. Using red sparkle gel, add blood-like drizzles on the sandwich. 1. Decorate the bottom of a dark cookie sheet with green apple licorice so that it looks like grass. 2. Place the RIP tombstones on top of the green apple licorice. 3. Place the ghosts in the middle of the cookie sheet. 4. Scatter coconut flakes toward the top of the cookie sheet so they look like clouds. 1. I recommend that you buy your ghost cookie cutter first, then find the right bread size that minimizes the amount of bread wasted after you cut out the ghost pattern. 2. Sometimes it’s hard to cut bread using a cookie cutter, so just use a sharp knife to clean off the edges. 3. When you’re carving the tombstone-shaped bread, it doesn’t have to be perfect. You’re going to cover it up with edible red sparkle gel anyway. 2. You can prepare these peanut butter and jelly sandwiches the day before your potluck or party. But keep in mind that the blueberry preserves tend to spread throughout the white bread.